The wise men at Peterborough Sports FC, from the left, chairman Stephen Cooper, president Colin Day, director of football Pat Rayment and manager Jimmy Dean. Peterborough Sports chairman Stephen ‘Tommy’ Cooper has saluted manager Jimmy Dean for steering the club into unchartered territory. 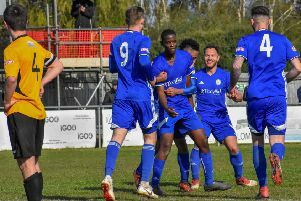 Sports sealed back-to-back United Counties League promotions when clinching the Premier Division title with a 3-1 win at Desborough last weekend. Peterborough Sports celebrate their United Counties Premier Division title success. That means step four football for the first time in the club’s history and Dean’s input - he’s won two titles in his first two full seasons as a boss - has been crucial. “What I like about Jimmy is he recognises his mistakes and looks to put them right next time,” Cooper said. “I have to remember he is still in his 30s and just two years into management. “He is absolutely full on, but it’s always for the good of the club. He shares the fierce determination to succeed that I have, and treats adversity, such as the FA Vase exit, to re-energise that determination. “Jimmy has a sound tactical brain and picks up bits and pieces from various people in the game. “Management is all about results and to achieve that you first need to know the difference between a good player and a bad one. “Much has been made of our budget, but it is not that far removed from a couple of other local clubs. What Jimmy with his very persuasive style has got, is great value for our buck and an ability to get the best out of our talent. “Whilst we had the luxury of director of football Pat Rayment introducing brothers Richard and Mark Jones into the club, they took huge pay cuts to buy into what we were trying to accomplish and Jimmy has provided the motivation to ensure we punched at our weight and beyond.